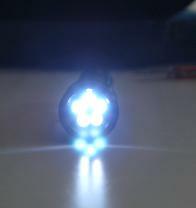 Our custom manufactured 5 LED flashlights are the highest quality, 5 LED lights that we have ever seen. Manufacturing starts from a solid piece of aluminum which is CNC machined to form the housing and cap. Wall thickness is 0.150 thick solid which is over 3 times thicker and stronger than a comparable Maglite. The LED are connected to a Voltage Stabilization Circuit (VSC) which maintains optimum brightness as batteries wear out. The LED and circuit board are press fit into the housing front and then sealed with epoxy to water proof and protect unit. The rear cap and switch screw onto the back of the housing with an O-ring seal to protect against water leakage. A sealed rubber switch in the battery cap turns the unit On / Off. The LED's are selected from the brightest ones available for each particular color. Voltage Stabilization Circuit (VSC) maintains constant voltage to LED's as batteries deteriorate. This ensures constant brightness. 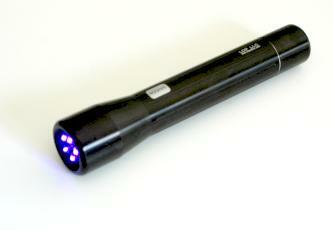 To see the rest of our 5-LED flashlight series, click here. Some invisible inks, such as our invisible blue, will fluoresce from 350nm to 410nm allowing you to use our lower cost 405nm light. Other inks, such as our invisible red (UVXPBR), will fluoresce faintly at 405nm but strongly at 385nm or lower. The 385nm and lower lights will fluoresce a greater range of materials. We also have a single LED 375nm light which can be seen here.